Cape Pincushion: Pinwheel quilt top finished! 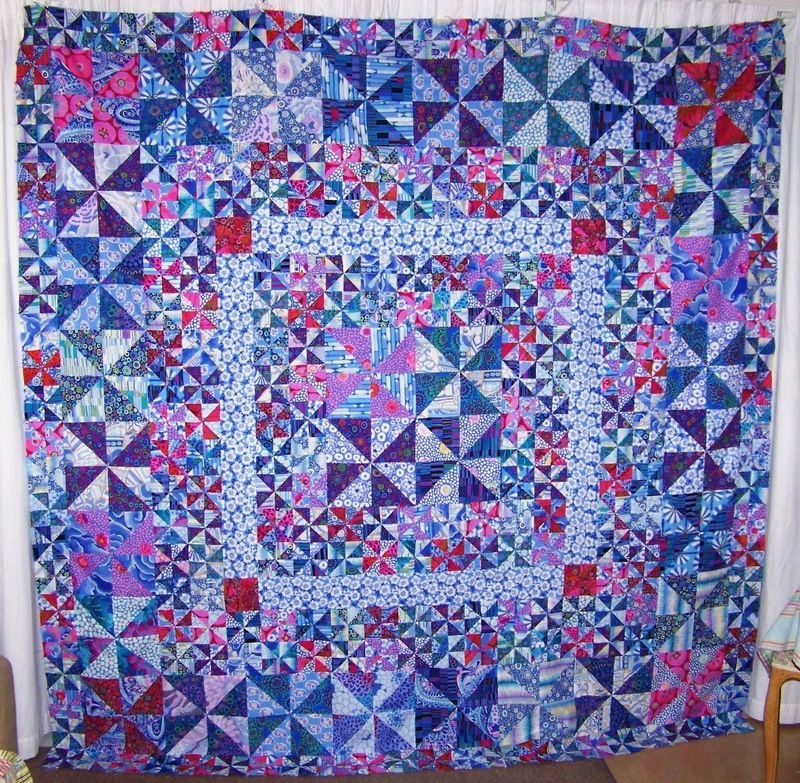 I finished piecing my blue pinwheel quilt yesterday. The quilt consists of 32 large 10.5" pinwheels and 256 small 4.5" pinwheels. To make a small 4.5" pinwheel, one needs 2 light and 2 dark 3" squares of fabric, which must each be cut in half diagonally to make the 8 right-angled triangles for each pinwheel. To make a large 10.5" pinwheel, one needs 2 light and 2 dark 6" squares of fabric, which must each be halved diagonally. One also needs 4 x 36.5" x 4.5" strips of fabric for the center plain bands. All seams must be 0.25". Finished quilt is approximately 88" x 88". Oh wow, it's stunning. And about the quilting: have you done any hand quilting and if so, do you enjoy it? I would only tackle such a huge quilt if I really enjoy doing it. Otherwise, have it done by longarm machine. Otherwise, as you said, it might never get finished. And wouldn't that be a shame!!! What a stunning quilt, well done on all that piecing, it makes me tired looking at it. If you could commit to hand quilting such a biggie, maybe look at perle cotton quilting, it's a lot faster and would suit the quilt. Maybe getting it proffessionally done is the way to go if you can't see yourself committing to the time though. I'm no help, lol. Je quilt is geweldig MOOI! This is an absolutely stunning quilt. If you love handquilting then you should go for it. This is a top that deserves the best. Otherwise... a professional is a good option. Again, lovely work.